Life in Extreme Environments: Who is on Top in the Food Chain and How Much do They Eat? 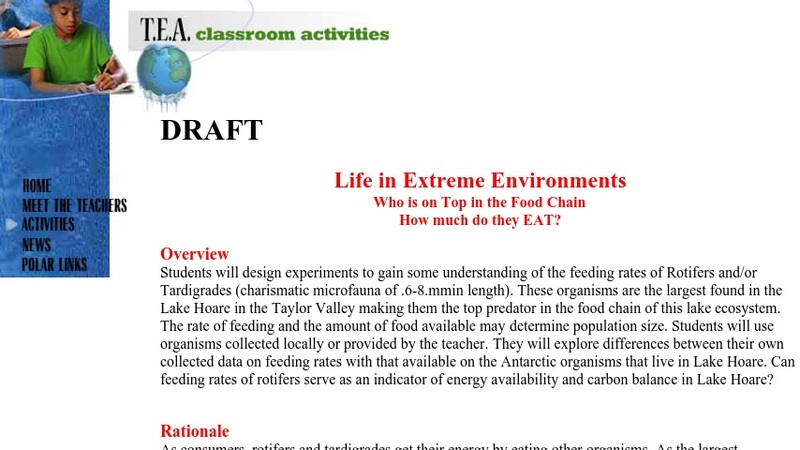 This lab activity encourages students to design experiments in order to gain some understanding of the feeding rates of Rotifers and/or Tardigrades. Students will use organisms collected locally or provided by the teacher. They will explore differences between their own collected data on feeding rates with that available on the Antarctic organisms that live in Lake Hoare. The resource, available in both HTML and PDF, includes a teacher preparation activity, teaching sequence, and student handouts.